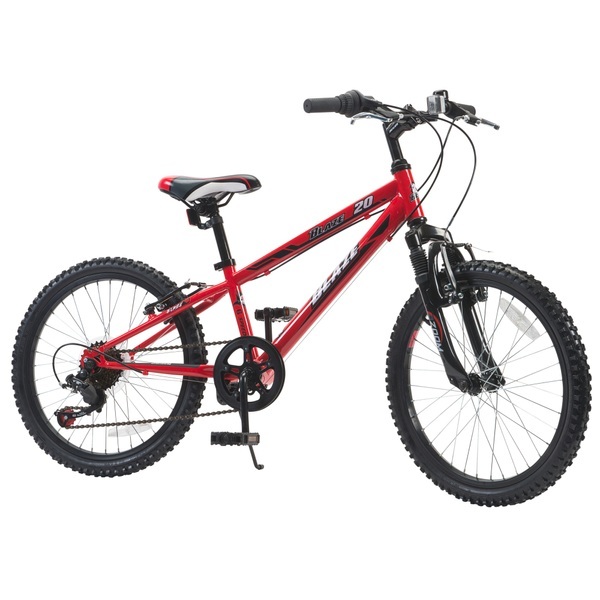 Kids will love riding the 20 Inch Blaze Bike! This striking red bicycle is sure to stand out from the crowd. Built with a steel frame for strength and endurance, the 20 Inch Blaze Bike features 6 speed gears, so you can customise your ride to suit your environment. The easy to use twist grip Shimano shifter and the rear Tz50 derailleur bring the precision of Japanese design to your gearing, so young cyclists can choose the power that works for them. Cycle uphill in a low gear, cruise over regular terrain in a medium gear and change to a higher gear to travel a long way with each turn of the pedal when speeding up or cycling downhill. The bright red frame of the 20 Inch Blaze Bike is given a cool sporty look by black and white graphics. This theme is continued on the comfortable saddle in black white, grey and red. The alloy V-brakes operate with a direct-pull mechanism for instant braking action. Zoom front suspension and alloy rims with air pumped tyres make sure that kids can ejoy a smooth ride on this bike. The 20 Inch Blaze Bike even features a kickstand, so you can keep your new bike upright wherever you go.